Interviewer: One of the things that we've talked about in the past is the study that was done in McGill Cancer Clinic where they interviewed 64, I think, oncologists discretely and asked them if they were diagnosed with cancer or if a loved one was diagnosed with cancer, would they submit to chemotherapy? And the statistics were actually pretty shocking. 58% of them said, no they wouldn't. That's over 90% of oncologists who regularly prescribe chemotherapy to their patients, who would not take it themselves or their family. To me that shows that there are many oncologists out there prescribing this chemo knowing that it harms the patients and doesn't do any good. Just for the fact that they want to keep their job, or they want the money or what are the reasons? In your opinion, what do you think about that study? Dr. Michael D.Farley: I've met dozens and dozens and dozens of oncologists in my 30 years of practice. And the truth of the matter is this is going to upset a lot of the medical community, but when I talk to them about it they start understanding.I've met one oncologist in my life that wouldn't be classified as a sociopath.And you can define sociopath. Interviewer: Yes, when I hear the word sociopath,I think of somebody that has no social conscience. That would do whatever it takes to further themselves at the expense of others. Dr. Michael D. Farley:That's a perfectly good definition. No remorse. Yet, they're willing to give chemicals to a person, knowing that they're not going to help the person.Especially if the oncologist has been doing it, for any length of time at all,knowing that it causes harm, collecting the money for it and moving onto the next patient. And that by definition would make them sociopathic. No conscience, no remorse, yet giving them drugs they themselves would never take.I know that sounds terrible and I know there are exceptions. But, the exception is I've only met one in 30 years who actually did a television show with me and went over that year's cancer report from the American Cancer Society. In which,they showed that there has been a decrease in prostate cancer, which was all that they could show as positive in one area of the country. Well, I read the same report she did, only I went a little bit further and did a little bit of research and found that that area of the country had the lowest rate of rectal or prostate exams in the country. So, the area that had the decrease in prostate cancer, was not getting treated for prostate cancer or tested for prostate cancer. So they had the lowest number of deaths from prostate cancer.And I gave this to her on the show,and she gave me this really strange look and she said, "you know, to be honest, you're absolutely right. You're absolutely correct." And after the show she came up to me and we talked for a brief time and she said "Everything you said was correct." And within a week she had left oncology in Florida and moved to North Carolina to practice a different a type of medicine. She was the only one that really had a conscience and I dealt with one of her patients before. A hepatic cancer case that ended up doing very, very well. Getting over the cancer and actually, a year and a half later dying from an infection in the hospital when they were doing some gastric surgery. Which happens quite often. Which happens very often, yes. Iatrogenic death is, is much, much more prevalent. We all hear how high it is. There are several hundred thousand or they say 200 to 300 thousand a year, actually is probably many times that. Interviewer: Iatrogenic meaning doctor induced? Dr. Michael D. Farley: Physician induced death and that can be physician induced also includes nurses. 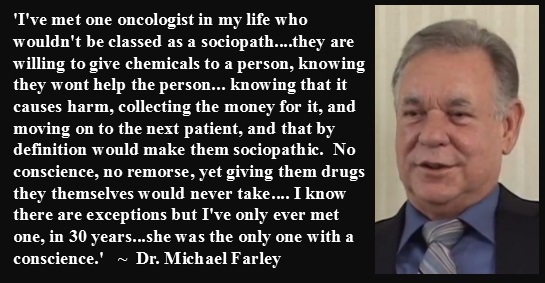 Dr. Michael D. Farley: You know, they go from one patient to another, they spread MRSA for example, methicillin-resistant staph and patients die and so you know, they answer your question, when I say sociopath, I don't take it lightly. I take it very seriously. The ones I've known the most closely have been that improving it. Interviewer: Well, it's almost the opposite of the Hippocratic Oath, isn't it? Dr. Michael D. Farley: It is the exact opposite of the HippocraticOath.Interviewer: Yes.Dr. Michael D. Farley: It's funny, MD's and ND's both take the Hippocratic Oath. We will do no harm. Naturopaths actually follow it. Dr. Michael D. Farley: Their preemptive goal is to find cause, treat cause of disease and create health. On the other hand allopathic physicians don't tend to take it quite so seriously. Interviewer: That's an understatement, isn't it? Dr. Michael D. Farley: Yes that would be an understatement. But, I don't want to paint all doctors with a real broad brush. Because there are a lot of extraordinary physicians. I'll give you a great example. When I moved to Melbourne, Florida, there was a very, very large orthopedic group. And I won't name their group but they had one physician that was an extraordinary orthopedic surgeon, specialized in joint replacement and oncological surgery. So he'd been trained in oncology. He wanted to integrate medicine and so he called several of his friends and we had a meeting. The first meeting there were 12 physicians. We decided that those 12 physicians were interested enough to have another meeting. The next meeting there were 26 physicians that really wanted to get into integrative medicine. So that they could do more to help the patients. So we decided to have one final meeting and asked some final questions and tried to set things up, get things rolling. The next meeting there were 48 physicians there and this is just in Brevard County.And at that meeting I asked the simple question, "How many of you can practice outside of your group? How many of you are not bound by a non-compete clause?" Not one could do it. So it wasn't that the physicians did not want to learn, it wasn't that the physicians did not want to participate and really help the patients to the best of their ability. Their hands were tied. And the government tends to tie their hands, and in so doing creates massive medical bills that are unnecessary. Takes some of the really truly good doctors, the best doctors that have been, you know, practicing over 10 years, that know they need to know more. The longer you practice, the more you know you don't know, if you're a good doctor. It takes these doctors and defangs them, neuters them. They can't move forward like they want to.
' I always told my patients to please go to an oncologist. I knew a great number of them. And I would ask them to ask a couple of basic questions. Can you give me studies that show that what therapy you're recommending will improve my quality of life? They can't do it. Will you show me studies that if I take this, chemotherapy, radiation, whatever they're offering, can you show me a study that I will live longer than if I do nothing? They're aren't any. They can't provide it. If they can't provide documentation that your quality of life is going to get better or that you're going to live longer than doing nothing, why are you going to stay? Many of the cancer patients I saw were bankrupt. Their insurance would pay 80percent, and they go I'm covered, not realizing that the first chemotherapy treatment was going to be $30,000. And their 20 percent added up pretty quick, because there were 10 more chemotherapy on the horizon'.